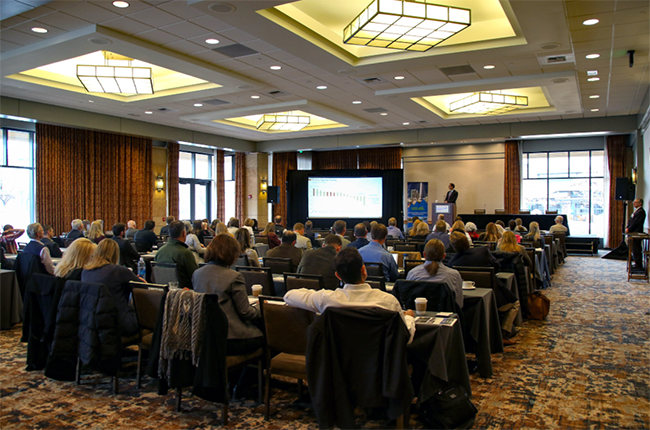 Westminster, Colorado – On Tuesday, April 24 the Economic Development Council of Colorado (EDCC) held its Regional Economic Development Forum, focusing on Region 3: Northwest Front Range, at The Westin, in Westminster, CO. 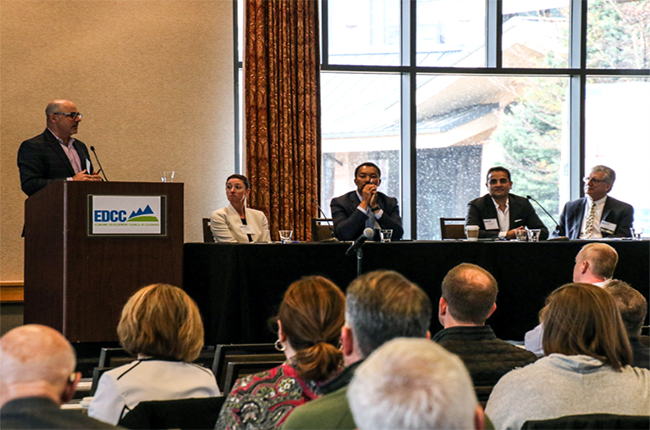 The EDCC’s Regional Economic Development Forums are an opportunity for the statewide organization to hone in on a specific area of the state and address economic challenges and opportunities facing that region. 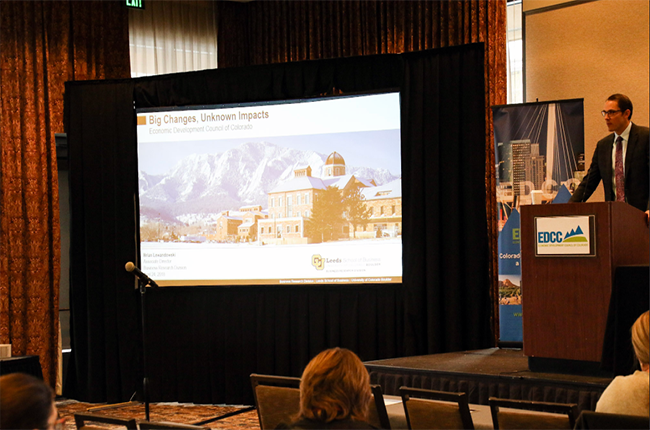 An audience of over 100 economic development professionals from across the area listened to experts discuss topics ranging from Placemaking to Smart Cities technology in an effort to better their own communities. The cities of Arvada, Boulder, Broomfield, Erie, Federal Heights, Lafayette, Longmont, Louisville, Niwot, Northglenn, Superior, Westminster, and southwest Adams County make up the region, that is known for its strong industry clusters, including aerospace, information and technology, and bioscience. Home to more than 20 research labs and two research universities, the Northwest Front Range is celebrated for its highly skilled and educated workforce. Brian Lewandowski, associate director of University of Colorado at Boulder, Leeds School of Business, provided an overview of the region’s economy, pointing out that while it makes up only six percent of total area of the state, the Northwest Front Range accounts for more than a quarter of the jobs in Colorado. The area is not without its challenges though, as Lewandowski pointed out, and the Northwest Front Range deals with a shortage of affordable housing, aging infrastructure and a lack of qualified workers. Placemaking was a key theme of the day, woven throughout various panels, including one on the development of Clear Creek Valley in southwest Adams County and how ensuring the inclusion of the residents of origin from the area help minimize gentrification. Additionally, placemaking was the focus of the Smart Cities panel, moderated by John Tolva, co-founder, Smart Cities Alliance and CityFi, and included specialists from Zayo, Trimble and the cities of Boulder and Westminster providing an overview of Smart Cities and how it is driving placemaking initiatives. 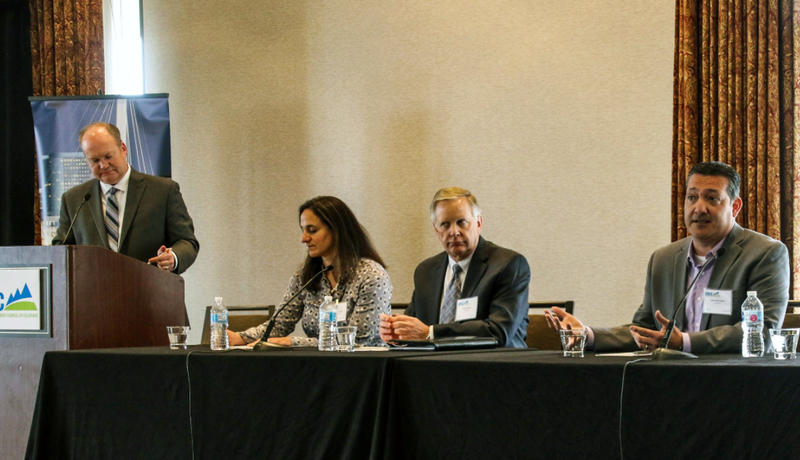 Local businesses also got the spotlight on a panel regarding the use of placemaking in workforce recruitment. Arvada’s Pie Global, Boulder’s TechTonic Group and Broomfield’s Webroot shared their strategies on how they attract and retain high quality employees, and provided tips for putting those tactics into place as part of a company’s overall culture. “One outcome of these discussions that kept rising to the top is that Colorado values livability. The thing that attracts and keeps people here – our quality of life and outdoor lifestyle – is what is driving future development, as well as how we look at development in a more sustainable and efficient way,” said John Hall, Immediate Past Chair of the EDCC and Director of Economic Development for the City of Westminster.